Bonsor, H C, Dahlqvist, P, Moosmann, L, Classen, N, Epting, J, Huggenberger, P, Garica-Gil, A, Janźa, M, Laursen, G, Stuurman, R and Gogu, C R. 2017. 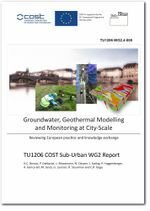 Groundwater, geothermal modelling and monitoring at city-scale: reviewing European practice and knowledge exchange. British Geological Survey Internal Report, OR/17/007. This page was last modified on 7 March 2018, at 13:59.